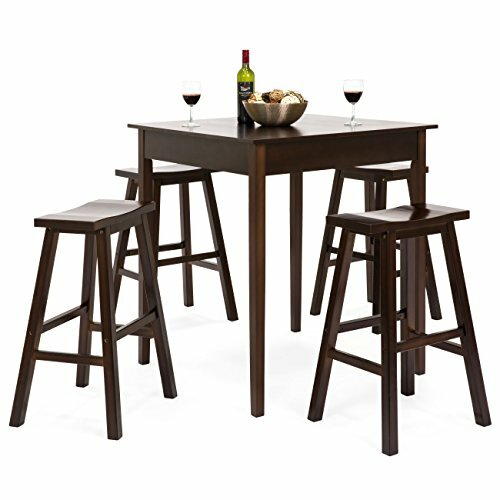 For a modern and inviting addition to your home, this 5-piece pub-style table and chair set brings a warm charm to any space. Designed with a rich walnut finish and clean lines, you'll have a timeless look that's sure to impress. It's a perfect fit for an apartment, small kitchen, or even your game room. This set embodies modern simplicity for an upgrade to any room in your home. Chair Weight Capacity: 200 lbs. Chair Weight (each): 12 lbs. Overall Dimensions: 34"(L) x 34"(W) x 39.25"(H); Table Capacity: 300 lbs. ; Chair Capacity; 200 lbs.